About two dozen cyclists on the Fuller Center Bicycle Adventure’s first group — the Orange Ride — going 3,500 miles across the country to raise money for and awareness of The Fuller Center for Housing’s work arrived in Craig, Colorado, on Tuesday, and the Craig Daily Press was there to talk with some of the riders. The riders were welcomed at a local park by community leaders and by Neil Folks, leader of the Moffatt County Fuller Center for Housing, who has the cyclists working today on multiple job sites as the riders have their third build day of the cross-country ride. 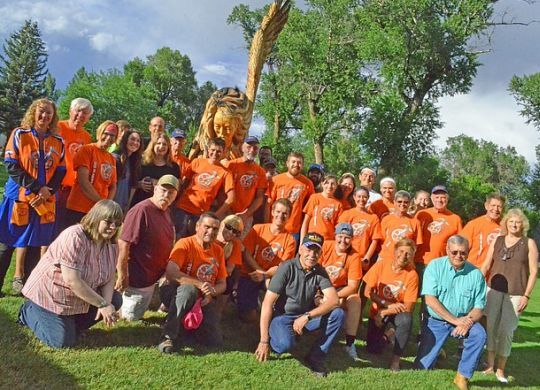 Because of record participation in this year’s Bicycle Adventure — which already has reached its $250,000 fundraising goal and is aiming for more — this year’s cross-country ride has been divided into two groups: the Orange Ride and Blue Ride. The Blue Ride cyclists will arrive in Craig on July 12, but the two rides will finally meet up for the final leg of the journey as it rolls into its final destination, Washington, D.C. SO WONDERFUL! I am so proud of each and every rider, and all the good they are doing! OYEE!